Turenscape architects were commissioned in 2009 to build a 34.2 hectare park in Harbin, China on an area of protected regional wetland that was slowly suffocating from roads and urban development on all sides. Their solution was to transform the dying wetland into a "green sponge," giving it the ability to collect, store and ultimately funnel stormwater back into the local ecosystem. 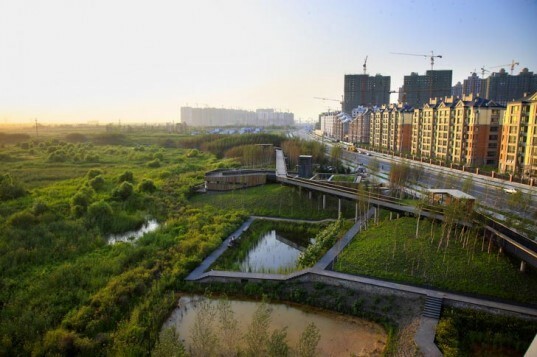 Turenscape's Qunli Stormwater Wetland Park put a stop to the damage done by urban encroachment while turning the site into a beautiful green space that can be enjoyed by local residents. Turenscape‘s plan for Qunli Stormwater Wetland Park sought to leave the natural core of the site untouched. This allows the indigenous plants and animals to maintain their own balance without any interference from humans. The next step was for the architects to create a necklace of ponds and mounds that surround the former wetland using simple cut-and-fill techniques. These landscape elements serve as an organic screen between nature and urban sprawl. Stormwater from the newly built urban area is collected in a pipe around the circumference of the wetland, and then released evenly into the park after being filtered through the ponds. Native wetland grasses grow in the ponds at various depths, and groves of native silver birch trees (Betula) create a dense forest setting. Raised platforms follow the path of the cut-and-fill water filtration system, as well as the outer rim. The experience is akin to walking through a forest thanks to the dense tree cover. Seats were also installed around the ponds to give people a chance to interact with nature. 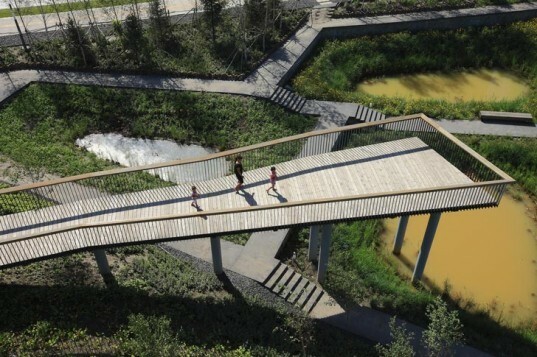 For those who want to stay out of the wetland, there is even a skywalk that links scattered mounds, giving local residents a chance to see the park from above via platforms, pavilions and viewing towers which form an artificial canopy. Since its completion, the area has been marked as a national urban wetland park, and the stormwater that used to cause flooding throughout the city has now become a valuable asset. It’s a fantastic example of how trying to fight the environment is an unwise move – often the best course of action is to accommodate nature instead. 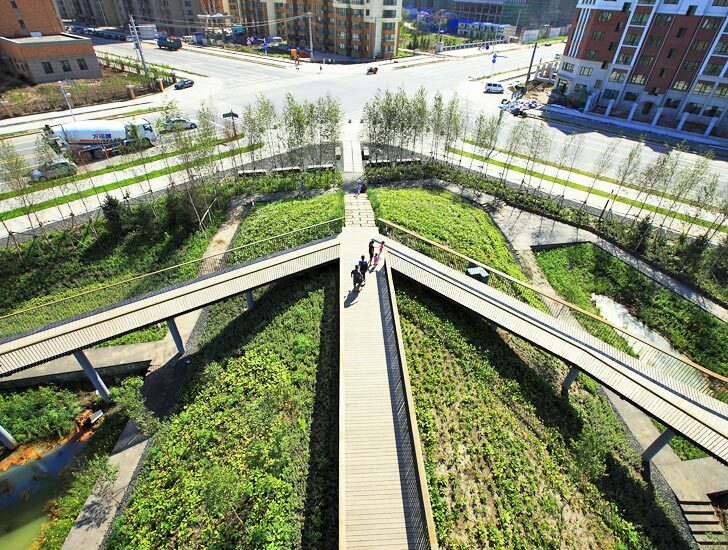 Turenscape's plan for Qunli Stormwater Wetland Park sought to leave the natural core of the site untouched. This allows the indigenous plants and animals to maintain their own balance without any interference from humans. The architects created a necklace of ponds and mounds that surround the former wetland using simple cut-and-fill techniques. These landscape elements serve as an organic screen between nature and urban sprawl. Stormwater from the newly built urban area is collected in a pipe around the circumference of the wetland, and then released evenly into the park after being filtered through the ponds. Native wetland grasses grow in the ponds at various depths, and groves of native silver birch trees (Betula) create a dense forest setting. Raised platforms follow the path of the cut-and-fill water filtration system, as well as the outer rim. The experience is akin to walking through a forest thanks to the dense tree cover. Seats were also installed around the ponds to give people a chance to interact with nature. For those who want to stay out of the wetland, there is even a skywalk that links scattered mounds, giving local residents a chance to see the park from above via platforms, pavilions and viewing towers which form an artificial canopy. Since its completion, the area has been marked as a national urban wetland park, and the stormwater that used to cause flooding throughout the city has now become a valuable asset. It's a fantastic example of how trying to fight the environment is an unwise move - often the best course of action is to accommodate nature instead. The urban landscape creates a stark contrast with the lush green wetland that stretches out beyond it. Master plan showing the various buildings, paths and wildlife that you can find in the park.